I try to keep close tabs on the Hammond Marina Kumlien's Gull once we get this late in the season. Yesterday, I found it hanging out on the "No Wake" sign at the harbor mouth - my third sighting of it this month. It wouldn't be unusual for this bird to continue into the last week of April. On average it seems Kumlien's - in general - linger later into the Spring on southern Lake Michigan than do Thayer's. For what it's worth, here are both the Illinois and Indiana record late dates for this species, respectively: 26 May 2005 and 12 May 1999. There are no June records of this species in either state. Interestingly, there are later Thayer's records in Illinois (28 May 2008) and Indiana (20 June 1978). The Wisconsin lakefront, having so much more shoreline and being some 300 miles to the north of us when considering the northernmost extreme of the state, occasionally sees these white-wingers into June. I personally have a Thayer's June record from Sheboygan, Wisconsin and a record late date from 11 July 2014 (Sheboygan, Wisconsin). But still, on average, there seem to be more Kumlien's records on Lake Michigan later in the season than Thayer's. Calumet Park. Chicago, IL. 12 April 2015. Great Black-backeds generally don't allow close approach on Lake Michigan, but this youngster has let its Spring restlessness get the best of it. These bands are variable - some being very narrow while others as thick as what's seen on the bird above (here's a collage I've put together demonstrating this). Let's get the gull in flight out of the way first: Adult Laughing Gull. Franklin's Gull would be a fair contender but definitive adults tend to show less black on the outer primaries with traces of a white medial band. The medial band partitions the black subterminal region from the gray on the upperwing (see here). Now for the standing birds. Both are in their 1st plumage cycle (first winter) and happen to be the same species. Interestingly though, the bird on the right appears smaller and has greater coverts that are darker and more solid. Those two characteristics alone may convince an observer that they're looking at two different species, but this is nothing more than expected "variation" found at the species level. Note that the overall uniform brown coloration to the upperparts is a good indication we're looking at black-backed species, and not Herring Gulls. The anchor-shaped centers to the lower scapulars, all-black and straight bills, and elongated look to the wings all point towards Lesser Black-backed Gull. 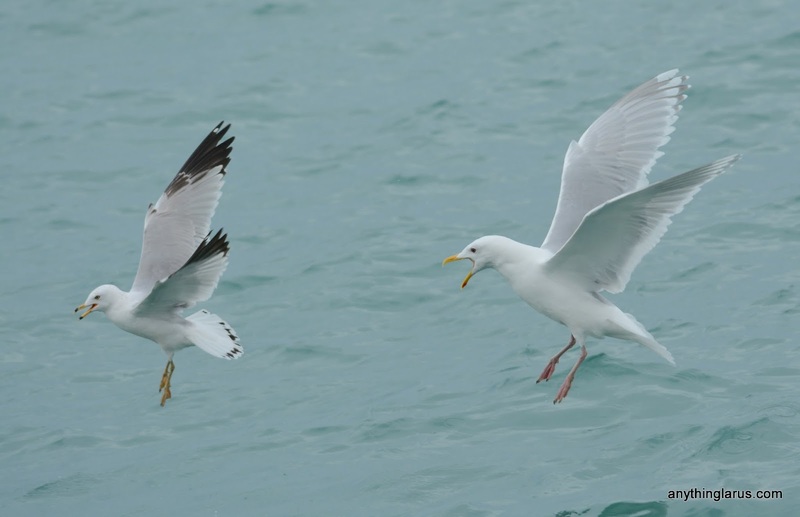 The lightly barred undertail coverts and lower belly (seen better on the right bird) is also a good indication of a non-American Herring taxon. First cycle LBBG presents some challenges for beginning birders. Identifying them is much more a matter of being familiar with Herring Gull and eliminating that species first. My advice would be to stay with any gull that you suspect may be a 1st cycle Lesser until it opens its wings and until you see the uppertail pattern (here's an example showing the paler uppertail coverts and darker inner primaries). This photo was taken in Volusia County, Florida on 24 January 2015. 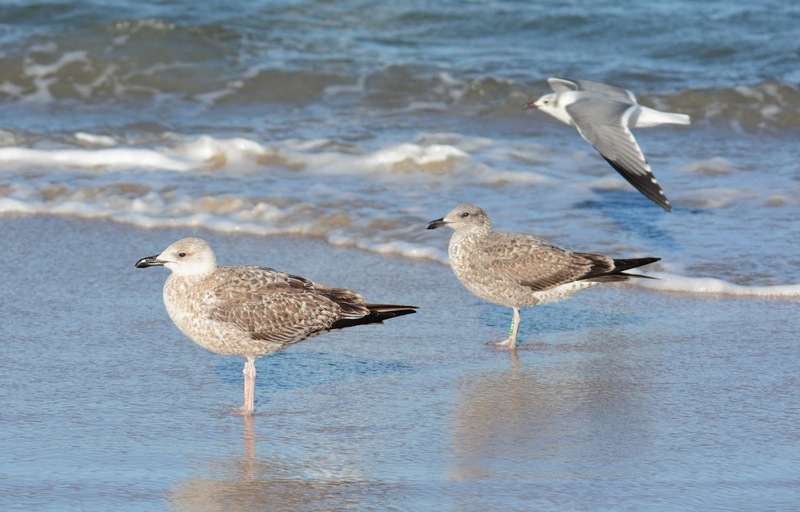 Incidentally, the smaller individual on the right is Florida's first banded Lesser Black-backed Gull, and was sexed as a female (which average smaller bodies and proportions than males).